On December 13th 1922, the Cricket Committee of the South Australian Cricket Association considered an application from the Prospect Cricket Club to compete in the S.A.C.A. District Competition. After some negotiation, it was decided to admit the Prospect Cricket Club to Section 2 of B Grade in Season 1924-25 with headquarters at the Prospect Oval. The main requirement in the agreement was that a turf pitch be made available on the Prospect Oval. In this first season in the S.A.C.A. competition, the Club finished 2nd on the premiership to Sturt. During the period 1926-27 and 1927-28, the late Mr. Joe Travers of the Adelaide Cricket Club had discussions with the Hon. Secretary of the North Adelaide Cricket Club, Mr. M.F.Brown, with a view to alteration of boundaries. Briefly, the proposal was that the North Adelaide area would be acquired by Adelaide and that the headquarters of the North Adelaide Cricket Club be transferred from Adelaide Oval to the Prospect Oval. There followed lengthy talks between all interested parties, and, finally, the North Adelaide area was transferred to Adelaide Cricket Club, the North Adelaide Cricket Club moved its headquarters from Adelaide Oval to Prospect Oval, amalgamated with or absorbed the Prospect Cricket Club, assumed the name of the Prospect District Cricket Club, and was admitted to S.A.C.A. A Grade competition. 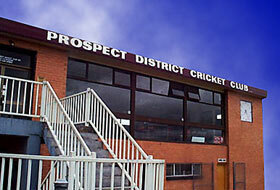 The Prospect District Cricket Club was founded, therefore, and first played in Season 1928-29. The club won it’s first SACA premiership in the 1936-37 season under the captaincy of A. E. Cole. The Club’s first Captain was C.E.Pellew, a former Test cricketer who played for Australia against England and South Africa in the early part of this century. The Club had to wait until the 1960/61 Season to annex their first A Grade premiership, and then during the next 12 years played in 10 grand finals, winning a further 6 premierships. Prospect District Cricket Club approached Garfield Sobers (the great West Indian Test cricketer), to play for the Club during the 1961/62 Season on a contract basis. This venture was a huge success and both Prospect and the S.A.C.A. benefited, Sobers agreeing to return for two more Seasons. Following Garfield Sobers was Barry Richards (from South Africa) in 1970/71 and lastly Younis Ahmed (Pakistan) in 1972/73. International cricketers who played for Prospect over the years were C.E.Pellew, C.W.Walker, T.W.Wall, G.S.Sobers, A.A.Mallett, T.J.Jenner, J.R.Hammond, R.M.Hogg, B.A.Richards, G.J.Cosier, Younis Ahmed, A.L.Logie, A.K.Zesers, G.S.Blewett and L.Vincent while over 50 players have represented the South Australian State Team. During the 1997/98 Season, the Prospect District Cricket Club won the A Grade West End Cup One-day Competition and also won the B Grade Premiership. In 2000/2001 the Club was successful in winning the A Grade premiership, the first in 30 years after a winning streak of 10 matches straight which culminated in the ultimate prize. In 2006/07 a Scorpion Shield girls team was entered in the SACA competition and in 2007/08 a Women’s C Grade team competed, winning a Twenty/20 Cup and a C Grade Premiership in Season 2008/09. The B Grade Women’s team won the SACA Spirit of Cricket award from all other Women’s Grade teams in 2010/11. Prospect’s latest Premiership win was by the SACA Under 16 White team in 2011/12. Sir Alwyn Barker CMG*, Mrs P.I.Stradling*, Mrs V.Reidel , Mrs S.Ellicott. A.Ambler*, L.Ault*, R.Baker*, R.Blewett, D.Blunden, M.F.Brown*, D.Callan, G.Clarke*, A.Claughton*, S.Clutterbuck*, N.Claxton*, A.Cole*, H.Cotton*, R.Craig*, P.Crossing, J.Ducker, M.Eaton, M.Ellicott, D.Farrelly*, D.Freeman, D.Gehres*, J.George, L.Goodenough, G.Griffin*, R.Hammond*, G.Hill, R.Hodge*, D.Hogan, A.Hope, T.Horley*, S.Hynes, A.James*, D.James*, T.James*, J.Kierse*, T.Klose*, K.Lewis*, P.Lewis*, T.Lewis*, T.Lowrey, H.Macfarlane*, M.McInnes OAM*, D.McIntosh, D.Marsh, H.Matheson*, R.May, L.Michael*, P.Milne, M.Mueller*, N.Neil*, R.Neville*, G.Patterson*, J.Pellew*, C.Phillis, R.Prater*, D.Read*, B.Redpath AM*, L.Reidel MBE*, C.Rix*, R.Roocke, P.Semmens R.Simmons*, S.Simmons, D.Sobels*, I.Stradling*, D.Strudwick*, G.Sutton*, R.Sutton OAM*, L.Thompson*, G.Uzzell, J.Vaughan, T.Wall*, I.D.Walsh, J.Webb, S.Wellington*, B.Wickham*, E.Wohling, L.Zeugofsge*.